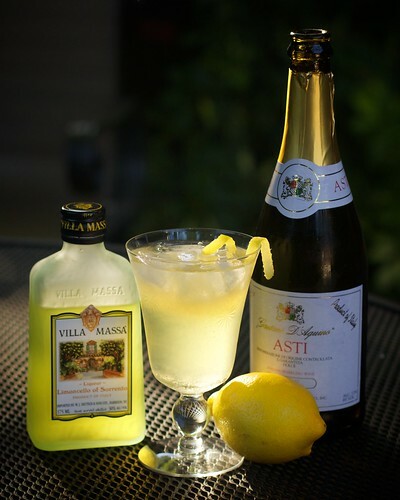 Admittedly “Limoncello Fizzy Sangria” is a bit of a deviation (some might even go as far as deviant) from the usual vintage cocktail vibe of this blog. I can only offer two items in my defense… summer and patio. For me, if you combine those two, you wind up at sangria. I may actually do a blog post some time on my usual (red wine) sangria recipe. Today’s post, though, is a tasty twist on the idea. I came across it looking for something to bring to a going a way party for our friends Meghan and Ben. This recipe comes from a book that I got as a gift from our friend Elsie called 101 Sangrias and Pitcher Drinks by Kim Haasarud and Alexandra Grablewski. Combine everything but the prosecco (and the mint/lemon twists) and give it a stir. Refrigerate for a few hours or overnight. Add ice to glasses and fill half way with the wine/limoncello mixture. Top up with the prosecco and garnish. Something (probably insect-like in nature) ate my mint, so we went with the lemon twist as the solo garnish. B & I both think this one is a nice addition to our patio entertaining repertoire. It’s both festive and refreshing. It’s also easy to make for a group. One last thing, for anyone interested in a great blog about science, I highly recommend checking out our friend Meghan’s blog Aliquots. Sounds perfect for California. I shall try it. Great photo too! Brenda take the photos. I really liked the light that she got on this one. She’s definitely better at it than I am. M- That looks delicious! (And thanks for the shout out.) Hope all’s well with you and B!